Guitars - being predominantly made of wood - can be susceptible to changes in heat and humidity. Even the change of season can cause the wooden components of the guitar to expand or contract, this can have repercussions to the sound and play-ability of the instrument - even if the instrument is not played regularly. 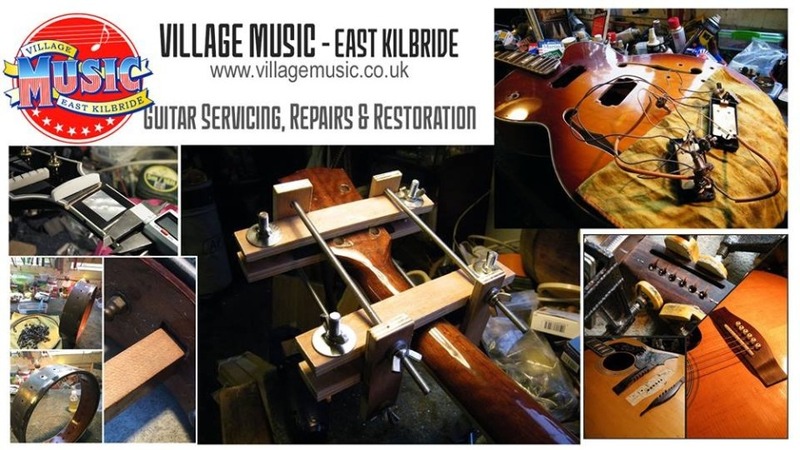 Our professional guitar repairers are always more than happy to help you keep your instruments in the best condition possible, and offer free quotes - minor repairs, to full restorations. Each instrument and repair/ service is unique, so we prefer to offer quotes on inspection, but below is a price guide for the type of work we regularly carry out. Mini Service - £35 + Strings - *Mini service is only for instruments which have been recently - within 4 month - serviced and set up by a professional repairer. - Please note this price-guide is only a guide. Prices for parts may vary slightly. Additional charges may apply for hollow-body/ arch-top guitars, or guitars fitted with floyd-rose tremolos. Major repairs/ refurbishing/ Restoration may be charged at bench time. - Estimates will be provided on inspection - any changes to estimate will be notified. - Woodwork repair turnaround is 10-20 working days. - Instruments not collected 90 days after completion may be sold to cover repair costs.